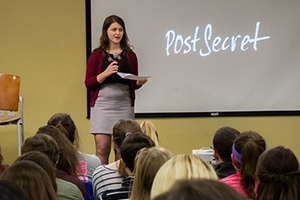 Research with a Purpose: How an AU Student is Addressing Mental Health on College Campuses | American University Washington D.C.
Mary-Margaret Koch at a PostSecret event. Credit: AU Photo Collective. Discussing academic research at conferences seems like the province of professors and graduate students, but Mary-Margaret Koch is ahead of the curve. Though still an undergraduate, Koch will be presenting a poster with her research findings at the University of Michigan’s Depression on College Campuses Conference in March. Better still, her research is pertinent to her classmates at American University and millions of college students nationwide. Koch focuses on mental health on college campuses, and she’s eager to reach new audiences at the conference. At the conference, Koch will share the results of her secondary analysis of the National College Health Assessment. Over the summer, Koch got access to national data from 2008-2014, and she concentrated on first-semester freshmen. She found that first-year students at all colleges—small or large, public or private—were utilizing mental health services. “It’s evaluating how effective counseling centers are at making sure students know that these resources exist the moment they arrive on campus,” she says. Though she wasn’t able to draw conclusions based on race, she discovered that female students were more likely than their male counterparts to seek out mental health resources. As part of the Community-Based Research Scholars program, Koch explored many of these issues for her Capstone. In recent years, she says, more students are reporting instances of stress and anxiety, but they’re also more likely to visit counselors. A recent Atlantic article called mental health centers the most popular offices on campus. If this seems extremely disconcerting, Koch says there’s a silver lining in that surge. “We see a huge increase in the number of students who are using the mental health services at their university. And in a lot of ways, that’s fantastic. It means that students are seeking help. It shows that these services exist, and students are taking advantage of them,” Koch says. Yet many of these institutions have staff shortages, and funding is always an issue for universities. “It’s creating new challenges. A lot of centers where you used to be able to get a same-day appointment have a waiting list for two weeks,” she explains. Koch previously served as executive director of mental health advocacy for AU Student Government. Some students criticized the AU Counseling Center in recent years, and Koch says her role was to help strengthen relations between the center and AUSG. To address urgent care needs, the Counseling Center now offers drop-in hours from 2:00-4:00 pm, Monday-Friday, she notes. She also credits the Counseling Center for its outreach efforts to students, including presentations at every freshman orientation session. “I think, compared to centers on other campuses, they do a really good job of being visible,” she says. Koch has promoted mental health in other venues on campus. In conjunction with the Kennedy Political Union, she helped bring Frank Warren, founder of the PostSecret community project, to AU for an event. She got involved in a campus version, where students could submit postcards—venting personal emotions and frustrations—displayed in the SIS Founders Room. After growing up in the Chicago suburbs, Koch came to AU to study political science. Now she’s a double major in poli sci in the School of Public Affairs and communication studies at the School of Communication. She’s currently a research intern for the reproductive rights group, EMILY’s List. Yet Koch doesn’t believe her political background is antithetical to her interest in mental health. She sees a challenge, and she’s examining data and public policy to understand it.